Problem: To finish its chintz sheets, Westpoint Stevens developed a proprietary resin that is cured at 312 degrees Fahrenheit for 150 seconds. To allow for the resin to cure, a number of processing steps were introduced which slowed down the entire operation. Analysis: Using the finishing range to cure the resin made it unavailable for its primary function -- high speed drying of uncoated material. Using the finishing range also required additional fabric handling including transfer and loading onto the range. 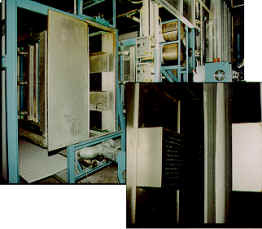 Solution: Wespoint Stevens installed an RSI designed air-flow electric IR curing system. Because the IR method is capable of heating to 1400°F, the system can adapt to the needs of a variety of fabrics and finishes. 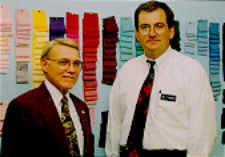 Westpoint Stevens now finishes the fabric at 50 yards per minute, the maximum speed of the calendar. With electric IR the fabric avoids contact with equipment that can cause defects and the resin is cured evenly over the fabric. Increased line speed -- from 30 to 50 yards per minute. Reduced floor space. 25 linear feet for IR, vs. 100 linear feet for steam cans. Lower Energy Costs. $8.74 per hour for IR, vs. $9.33 per hour for steam cans. Reduced Operating Costs. With zero maintenance for IR, the plant is saving at least $1,900 to $3,325 per year in maintenance alone. And there is no down-time. No Emissions or Products of Combustion. The cost to install the electric IR system was about $110,000. This compares favorable to the estimated cost of a 40 steam can system -- estimated at $180,000. Payback period was estimated to be less than 1 year.